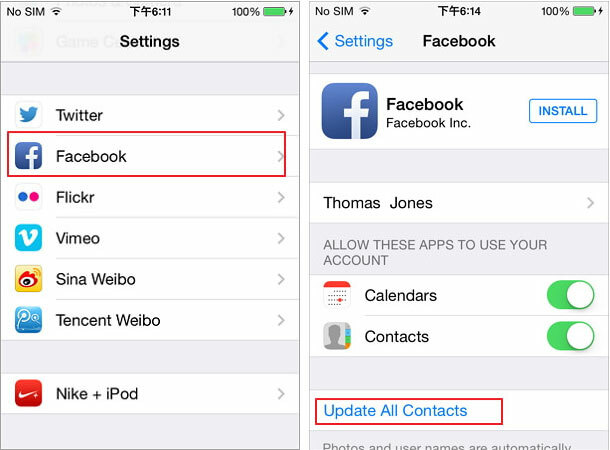 Home> Resource> iOS Transfer> How to Sync Facebook Contacts with iPhone Easily? With the using of iPhone Facebook app for a long time, people always saved lots of contacts information like phone number, address, birthday date, etc. in their FB account directly. So one day you decide to get rid of your old iPhone and get an all-new iPhone X/8, and find there is no contacts info on your new iPhone, have you ever wondered of syncing Facebook contacts to the new-purchased iPhone? Not a bad idea, right? But now the problem is how to do it in details? Actually, to sync Facebook contacts with iPhone, you have two options to reach it: one is to use the settings on your iPhone, the other is to ask for help from some apps. In this article, we could like to teach you how to sync Facebook contacts with iPhone by using the settings on the iPhone. If you're interested in it, please follow the below steps to move all contacts from Facebook to iPhone quickly. Step 1. Download and install Facebook App from Appstore and login it with your Facebook account and password. Step 2. Open Settings on your iPhone and find the Facebook App on it. Then you'll be required to sing in the account by your Facebook email and password. After that, you can turn on "Contacts" and "Calendars" on your device just like below interface. Step 3. 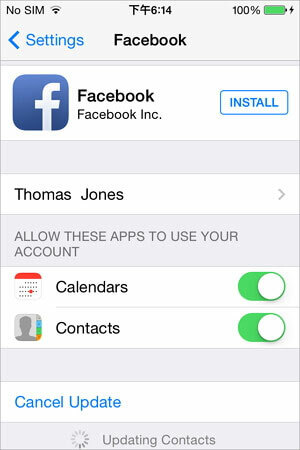 Tap "Update All Contacts" button to begin to sync iPhone contacts with Facebook easily. Tips: If you find some important contacts have been deleted or lost on your iPhone due to unknown reasons, don't worry, you can take a free trial on the powerful MobiKin iPhone Data Recovery software to get back all your lost contacts info on iPhone or backup files easily.